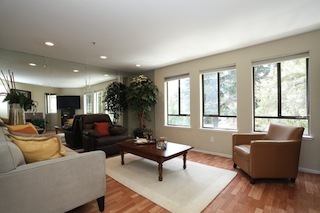 Come check out my open house today from 1-4pm in Palo Alto at 1424 Hamilton Avenue. Located in the highly desirable Crescent Park area, the home has 2,666 square feet, 3 bedrooms and 3 1/2 baths on a 7500 square foot lot. Originally built in 1931, the home has been recently remodeled, but keeps the original English charm with high beam ceilings, walnut floors and a vintage picture window. The home has two master suites, one on the main level and the upper master has dramatic vaulted ceilings and French doors that lead to the beautiful balcony and stairs descending to the garden. This amazing remodel integrates state of the art systems and exceptional finishes and crafstmanship. Luxury real estate in Palo Alto is selling well and this home is no exception to the rule that good homes are highly desirable especially in Palo Alto. The schools are Duveneck Elementary, Jordan Midle and Palo Alto high. The asking price is $3,995,000. Come out and say hello or give me a call if you are not represented and would like to get a tour or disclosures. This is the only open house and all other showings are by appointment only. 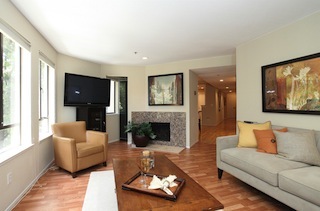 Enjoy urban style living in the heart of Palo Alto. 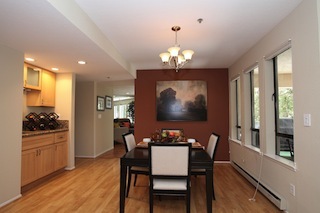 This beautifully remodeled 3 bedroom, 2 bath, 1695 sf single level condo has it all. 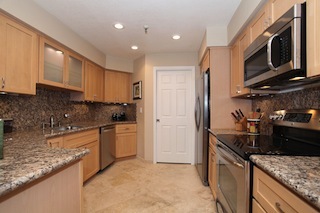 Remodeled kitchen with granite counter tops, travertine tile floors, new appliances, recessed lighting and new cabinetry. There is also a microwave with convection oven, five burner electric stove top, main oven plus warming oven, side by side fridge with built in filtered ice/water, overhead LED lighting, under cabinet lighting and in cabinet lighting and self closing drawers. The master bath has been updated with travertine tile floors, radiant heating, granite counter tops, limestone shower and new cabinets. The second bathroom has been updated with the similar materials as well. The interior laundry room has been completely remodeled with large stacking washer and dryer, food pantry storage and tile floors. The condo also has new carpeting and paint throughout as well as a refurbished wet bar with granite counter tops and new cabinetry too. There are new highly efficient LED lights in kitchen, laundry room, living room, hallway and bathrooms.It’s like walking into a custom condo as all the details have been closely paid attention to during the remodel that was completed earlier this year. Whether you are looking for a place to live or an investment property, this condo is for you. There will always be good demand for this condo as it is located in the highly rated and desirable Palo Alto school district. The condo is walking distance from the vibrant downtown University Avenue and its wonderful dining and shopping experience. The building has a 24/7 security entrance and underground private parking. Open House Saturday and Sunday 7/20 & 7/21 from 1:30-4:30pm. If you have any questions or interest, please contact Gary Kurtz at 650.543.1202 for more information or to set up a showing. Make sure to come out to my open house this Sunday. The address is 1212 Fulton Street and it is a charming home with a guest house that you will not want to miss. The home has 3,100 square feet that has been updated and has hardwood floors on the main floors and carpeting upstairs. There is a lower level studio with a kitchen and outside entrance. There is also a 600 square foot guest cottage with kitchen and loft style bedroom that is perfect for renting or extended family members. The price has just been reduced to $2,998,000 so it is a great buy at the new price. Please come by and say hello. 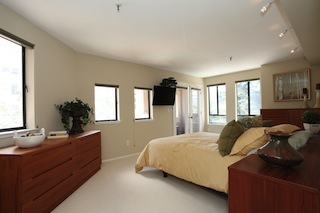 Come visit my open house this weekend at 580 Washington Avenue in Old Palo Alto. I’ll be there Saturday from 1:30-4:30 and Sunday from 1:30-4:40pm. Home is 2,000 sf, 3 bedrooms, 2 1/2 baths and located on a cul-de-sac. 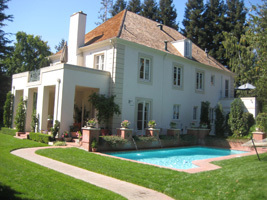 Great Palo Alto schools and walking distance to shops and restaurants. The house is charming with updated kitchen and bathrooms plus a nice outdoor area for barbequing and entertaining. Asking price is $2,795,000. Palo Alto real estate has been on a tear lately and prices have been ramping up due to the lack of inventory combined with lots of buyers who want to be in Palo Alto. There are only 27 homes on the market in all of Palo Alto, but more specifically, there are only 7 in the 2-3 million dollar range and only 3 homes at any price in Old Palo Alto. Stop by to say hello and sign up for my off market list of available homes in the area. Gary Kurtz is holding an open house today at 9 Atherton Oaks Lane in Atherton from 1:30pm-4:30pm. The house is listed for $6.7 million dollars and has 8,190 square feet plus 200 square foot pool house and 880 sf 5 car garage. It’s located on 1.09 acres and is very quiet and peaceful. The home is located next door to where Joe Montana lived when he was still with the 49ers. The home has 5 bedrooms, a library, guest suite, huge living and family rooms plus a master bedroom that is very spacious. A four car garage that has a car lift for a fifth car. Beautiful hardwood floors throughout the downstairs and a massive entry that must be seen. Come out to say hello or give me a call if you have any questions about the home. Yes, it’s a perk of the trade. If you were to combine Top Chef with Million Dollar Listing, you would get the ritual that most real estate agents here on the Peninsula experience on a weekly basis. Every week, agents put their new listings on “broker tour”, which is when they want every real estate agent to come by and see their new listing and quickly spread the word to their clients. If you get a lot of agents showing up and your house is priced right, it spreads the word exponentially so it’s really like an open house for agents. To help get agents (and the public) to show up, many agents add enticement, and nothing does it better than good old free food. Since the Primetime Emmy Awards for Outstanding Television are this coming weekend, I thought it would be appropriate to give my own real estate meets Emmy style award to the hard working, meal providing real estate agents out there who make our grueling treck to multi million dollar homes much more enjoyable. Sherry Bucolo of Alain Pinel in Palo Alto for her listing (also in Palo Alto) where she served very tasty chicken strips, fresh fruit, finger sandwiches and lemonade…all at one time. It’s polite to grab a couple of items after viewing the house…but I think I grabbed a small plateful between each floor – and there were three levels! The chicken fingers were better than a restaurant and there was even ranch dressing for dipping. Oh yeah, the house was nice too and sold within a week. Paul Engel of Coldwell Banker in Palo Alto who provided a “potential for a meal”. I say potential because he provided a lottery ticket to every agent who showed up. I haven’t checked my numbers yet, but if I win $5, then it’s McDonalds meal and no award. If I win $100, then a Sundance Steak and a victory. If I hit it big, I’ll buy Paul’s listing. Steve Papapietro and Ahmad Ghavi of Bank of America. These are lenders that provide broker tour food for various agents to help spark their lending business. Their main item – meatballs to die for! I don’t know where they get them, but they could make a tear down in East Palo Alto suddenly look like an Atherton mansion after eating the meatballs and washing them down with the iced tea they also serve. Nothing is quite the same after eating them. Ken DeLeon of Keller Williams in Palo Alto. Ken’s broker tours and open houses are infamous for his lunch setup which includes delightful double deviled eggs as well as the coffee cart that accompanies each new listing. The deviled eggs are huge and sinfully delicious while the mocha’s, lattes and hot chocolates are made with personality and Star Bucks like taste. I know agents who schedule their broker tour around Ken’s listings as you must show up around lunch to make the most out of this full free meal. Before I announce this someday important honor, keep in mind that potential buyers can also come to these sometimes tasty broker tour hotspots. All you have to do is call your agent and ask to join them on tour. Broker Tour is every day of the week in a different city, for example Menlo Park and Atherton are on Tuesdays, Palo Alto and Los Altos on Fridays etc. And if your looking to buy a home and don’t have an agent, call me and I’ll gladly serve as your Maitre d’. Ok, the music is playing and I’m running over my allotted word count. The Winner for best food at a broker tour/open house is………Steve Papapietro and Ahmad Gavi of Bank of America. Not only is their food great, but they are always at their open houses and add the element of nice conversation to the mix. A recipe for success. 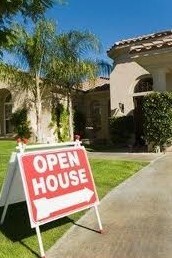 I spent the weekend looking around in Atherton, specifically the Lindenwood area trying to find a good open house. Wasn’t any to find this weekend and there isn’t a lot of homes for sale in there right now. There was a couple to look at, but I would consider them fixer uppers as opposed to a typical Atherton great home. If you want to find other areas for open houses, don’t forget to check my website on APR. Just put in the area you want to check out and let me do the work for you.